As first reported on this site some time ago Tomas Rosicky’s latest setback was absolutely not related to his usual problem of hamstring trouble. Sky and other media have been reporting that Tomas’s hamstring flared up as soon as the training regime was stepped up. This was all of course media speculation. Arsenal Analysis revealed that it was Tomas’s groin and not his hamstring that had flared up keeping him out of training. This was the verdict of Czech Republic national team coach Peter Rada who met Tomas recently in London. “Tomas has discontinued training but it is not because of hamstring injuries. He has a small problem with the groin, which would require only a few days of rest. Then he will return to full training” he said. Indeed, Tomas is now itching to get back into action but it will all depend on what Arsene Wenger says. “Arsène Wenger will determine when I play a match for the reserves. In England, the reserves of professional clubs have their own competition, which attracts a lot of spectators who create a pretty good atmosphere” he said on his personal web site. “The groin is no longer an obstacle for my come-back, I feel great”. All Gooners should not be surprised to see Tomas back in action very soon. And what a fantastic addition to Arsene Wenger’s armoury this will be. Hope he'll be back vs spuds reserves. Lets get down to Underhill you goons. Nice one, I've linked to this on my comparatively useless Friday evening blog. Have added a link as well. 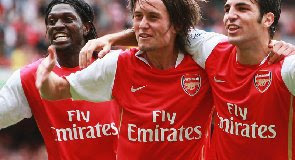 rosicky is so flipping good. we have missed him so much... imagine rosicky and arshavin on the wings, cesc, nasri and denilson/song in centre mid with any of our strikers up front 4-5-1 has never seemed so deadly. to must crock-sicky is finally back thank God. Hope he will make a valuable contribution in the rest of the season. hate to be a skeptic but I will believe it when I see it! We need the creative aspect in midfield - can't wait to see him back - we still haven't seen enough of Rosicky in an Arsenal shirt! Eduardo:" No problem lasts forever"